View of Tarbet on the western bank of Loch Lomond in Scotland. There has been a settlement at Tarbet since at least the 11th century. In 1263 Norwegians invaders used the village of Tarbet as a base to launch their raids on Loch Lomond. Although they caused much destruction they lost many men in a storm and were later defeated at the Battle of Largs. When Queen Victoria visited the area she described Tarbet as “… a small town… with splendid passes, richly wooded and the highest mountains rising behind”. 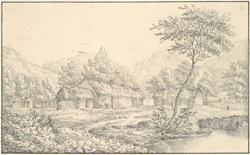 The cottages that can be seen in the foreground of this sketch would have been built for workers in the cotton mills and slate quarries of the surrounding area.